It doesn't get any better than having fun in the kitchen with your daughter while wearing these precious aprons from Handstand Kitchen. 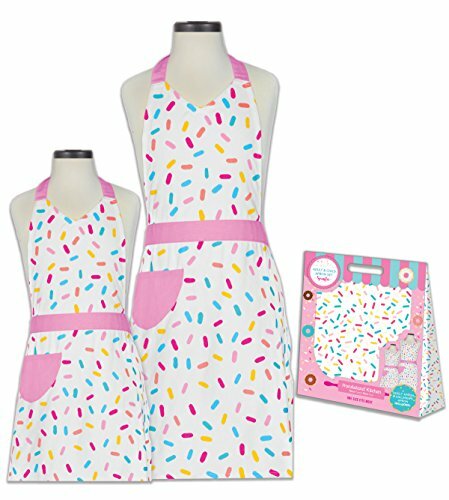 The darling sprinkle print is sweet and colorful and the bright pocket and ties add a pop of pink that make these aprons that are sure to delight. Adjustable waist ties add comfort and practicality that every chef, young and old, will appreciate. Highest quality aprons are constructed from durable 100% cotton that will stand up to spills and spatters and they are machine washable for easy care. Child's apron measures 25" long x 22" wide (excluding straps) and is sized for most children ages 5 to 9 years while mom's apron measures 30" long x 31" wide (excluding straps); one size fits most. Handstand Kitchen cookbooks and accessories are the result of the founder's deep desire to introduce children to home-cooked foods in a fun and hands-on way. Handstand Kitchen was launched in 2007 with the goal of getting kids cooking from an early age to empower them with lifelong healthy eating habits. Handstand Kids cookbooks are the perfect recipe for kids to learn about the people, places and language of a new country while also learning to create their own versions of traditional international dishes. Handstand Kitchen accessories include true kitchen quality tools that are sized just right for children as well as aprons for everyone who wants a look that's as beautiful as the dishes they are creating! Join Handstand Kitchen in bringing the pride of accomplishment and traditional comfort of home cooked meals to your children! If you have any questions about this product by Handstand Kitchen, contact us by completing and submitting the form below. If you are looking for a specif part number, please include it with your message.